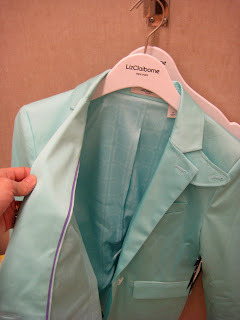 How long has it been since you've looked twice at Liz Claiborne? Could literally be a lifetime for some of you fashion bloggers. But now you really shouldn't miss it. 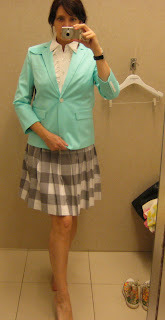 If I, a totally non pink poufy skirt type, can get excited by a visit to the Liz boutique at Macy's Herald Square, then you know you need to go. 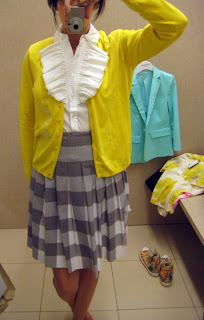 Jacket $119, ruffle blouse (worn w/both, and it's selling out fast) $69, check skirt $79, yellow cardi $59. Click on the middle to get an idea of some detail in this collection, piping, lining, etc. 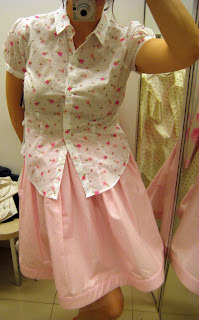 Skirt $99 (has a sheer crinoline! 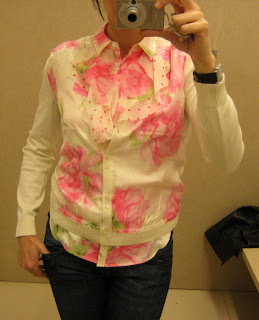 ), flowered top $59, black wrap blouse w/tie $59. 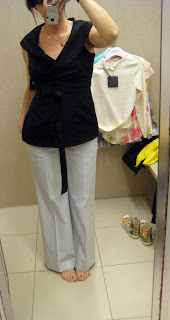 Same blouse from above, pants are $69. I also love the cut of most of the pants. 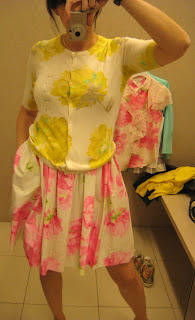 OD'ing on flowers: short-sleeved cardi $79, skirt $79. Happy clothes! Notes on the collection now designed by Isaac Mizrahi: in WWD Isaac said "This isn't fast fashion-this is value fashion." Exactly. This collection has surprising quality for a great price. I'm sounding like a Liz commercial here, but I was seriously impressed. Lots of cute linings, solid materials, and great details. Also, the cut is going to be a little big, as one would expect with Claiborne, but the fit is beautiful. This collection has Isaac Mizrahi all over it in all the good ways. 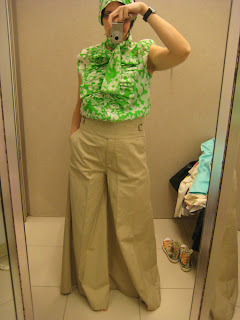 My Grey Gardens homage: ruffle green blouse w/tie $119 and worth every cent, super wide-leg meet-me-at-the-rave pants $79, LOVE. Granted, you need some legs for these . And that's the cute cami underneath. Ruffle blouse $89, blouse w/matching cardi (LOVE) $89. 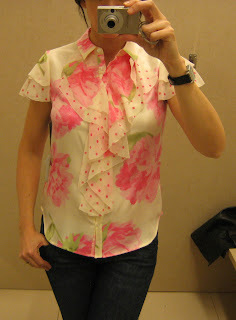 Blouse w/tie $69, and blouse same as above w/pink skirt. 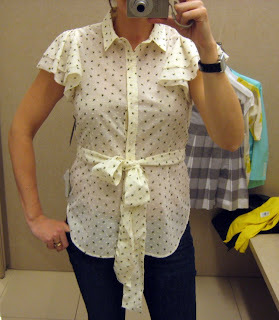 This is a perfect summer top. Looks like Little Edie on acid...which is a good thing! thank you thank you thank you for the pope fan photo, and you peeping out so coyly from behind it. Classic. Oh, I cannot believe you got to try it all on! We have been loving the print campaign and all of the pix of styles that we have seen... he has done an outstanding job it seems. It is all fabulous, especially the yellow cardigan, it looks so pretty on you Miss Fashion. And that shot with the detail in the mint jacket is great, they really have done a good job! 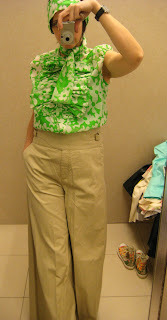 Hi there-what fabulous picks here, I'm loving the green floral top and beige trousers on you best, but so many lovely tops to choose from! I am so impressed with this collection! like the colthes, great blog!